An incredible book that I waited way too long to review. I especially enjoyed it since I had read Bury the Chains around the same time, so it was nice to see all the things I had just learned about in a non fiction book referenced in a novel. Another novel that started off strong, even if it wasn’t anything new, and just went downhill after the second half. For a while I thought that DRAMA meant personal turmoil, inner struggle and conflict. I’m not so old that I have forgotten what it was like to be a teenager, with all the private doubt and fear coursing through your veins on an hourly basis. So perhaps my students, who care so much for protecting and understanding themselves, thought of DRAMA as a subtle, internal tug-of-war. I’ve written before about the author Laurie Halse Anderson, a woman called by some critics: “the Reigning Queen of Teenage Angst”. While her most popular and prevalent books remain modern stories of endangered young women. 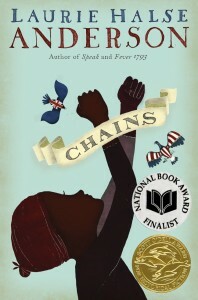 But a recent run of historical fiction, beginning with Chains, has given her a different audience, and a different setting to play in, even if the power of her protagonist’s internal struggle remains the same. Embedding herself in revolutionary America, Anderson establishes a powerful heroine in Isabel Gardner, a girl no more than 12 who has lost her mother, father and cares for a younger sister in the grips of epilepsy. And while that, in and of itself, is enough to recommend her as a superb role model for young girls, the fact that Isabel is also struggling to free herself from the bonds of slavery adds a powerful element to the character and the story. Anderson, as usual, does not accept an easy or stock answer to questions of right and wrong, just or unjust. Though Isabel suffers under slave laws and a petulant mistress, she finds solace in the compassion of people both white and black, working class and landed gentry, immigrants, indentured servants, rebels and British officers. The subtle interplay of individual personalities eventually creates a complete portrait of New York City in 1776 through the eyes of one slave. Isabel’s struggle is clearly different from Anderson’s other protagonists, and so is her internal struggle. The physical pain or visceral emotions experienced by Melinda in Speak or Lia in Wintergirls is not as apparent for Isabel. Instead hers is a a familial despair borne of the situation and her inability to protect and nurture the one family member she has left, and a philosophical disbelief that the right thing to do is ignored by far too many people. Whether students appreciate that philosophical struggle in the same way they acknowledge the physical pain or visceral emotions of other protagonists, I cannot say. Nor can I say whether or not young readers will push through Isabel’s formal language. Having learned to read and speak from concerned owners, she shows a grammar school appreciation of proper speech, which can seem alien to the modern day short hand of contractions and elisions. I am thoroughly convinced that Chains is an excellent text, worthy of study, though perhaps not among readers for whom contemporary language or general abstractions is a challenge. First of all, I love the title of this book. It is taken from Shakespeare’s “Merchant of Venice” and is one of my favorite speeches of all time. It also has a special resonance in this book which, as the sequel to Sacred Hunger (which I reviewed earlier this year), is a worthy read in its own right but made especially powerful for knowing the back story. Unsworth’s The Quality of Mercy takes place in England, 1767, where banker Erasmus Kemp has finally brought back in chains the handful of surviving crew members who had mutinied on his father’s slaveship 14 years earlier and who he had relentlessly pursued to their hidden colony in Florida. Back in London, Kemp wins their conviction on piracy charges and their execution, but achieving his revenge for his father’s indebtedness, bankruptcy and suicide does not fill the emptiness of his soul. Unsworth moves the bulk of this story to the battle over abolition of the slave trade inside England, and to another form of slavery, that of the coal miners in northern England trapped in an endless grind of child labor, poverty, and an early grave. Kemp recognizes that the advent of the industrial age makes coal a lucrative investment for his bank, and sets his sights on the coal mines of Durham which happens to be where one of the escaped crew members from his father’s ship is headed. At the same time, Kemp hopes to fill the void in his life by courting Jane Ashton, sister to the fervent abolitionist lawyer who is leading the fight against slavery in England. Despite their dramatically different viewpoints, Jane and Kemp are drawn together but Jane is disturbed by Kemp’s fierce rigidity. It takes Jane’s cautious but loving admonitions, as well as coming face to face with the escaped crew member and experiencing the emotional strength of a coalminer’s son who has just lost his dad in the mines, for Kemp to finally get in touch with his own humanity. Unsworth portrays the entitled lives of British aristocrats and the enslaved existence of the British coalminers with equally exquisite attention to detail, and his courtroom scenes are brilliant. The reader suffers with the condemned men on their way to execution and with the 7-year-old about to put away childhood and enter the mines with his father and brothers. Unsworth recreates the drama of the period, while taking the time to paint portraits of his main characters who are in truth flawed, but also susceptible to change. Therein lies the magic of his book’s title, and of his talent. Toni Morrison’s “Beloved,” which won a Pulitzer Prize in 1988, is an American horror story featuring a haunted house at 124 Bluestone Rd. in Cincinnati. This is where former slave Baby Suggs lives, her son Halle having bought her freedom, and where eventually, Halle’s children and wife Sethe live. Shortly after escaping to Cincinnati, Sethe is pursued by the “school teacher” who wants to take Sethe and her children back to “Sweet Home” plantation. Rather than allow that to happen, Sethe tries to kill her children. She succeeds in killing her older daughter, Beloved, whose spirit then inhabits 124 Bluestone and who, 18 years later, returns in solid human form. While Beloved’s presence — spiritual or physical — in the house disturbs and drives people (mostly males) away, the true horror is slavery, the horrors that whites inflicted upon Africans for 200+ years, horrors that left scars both physical and psychological upon the oppressed. Years later, when Sethe and her surviving daughter Denver find a 20-year-old woman waiting at the stoop of 124 one afternoon, they immediately recognize her as Beloved returned as an adult, and are overjoyed. Denver has been lonely and fears her mother. Sethe longs to be reunited with her child, to explain herself, to be loved again in return. The three women remain isolated from their community, absorbed only in themselves. Eventually, the relationship between Sethe and Beloved becomes aggressive and combative, leading Denver out of the front door alone for the first time in over a decade and into the community for help. The final “exorcism” leaves Sethe spent, broken, and nearly guilty of committing another murder. It also seems to be the start of healing for Denver, Paul D, Sethe and their community. “Anything dead coming back to life hurts,” says one character. This is true of flesh and of memories. Perhaps it’s not possible to manage that pain alone. Beloved is a brilliant, riveting novel, an American classic rich in detail and beautifully written. Read it!